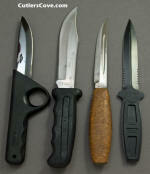 Hunting Knife, Skinning Knife, Camp Knife, Utility Knife and General Purpose. Also hatchets, axes and machetes. Click here to learn how we grade our knives?